Little Nellie is going to make an appearance at a vintage car and motor bike rally to be held in Diss on Sunday 23rd August according to an article in the Diss Express. 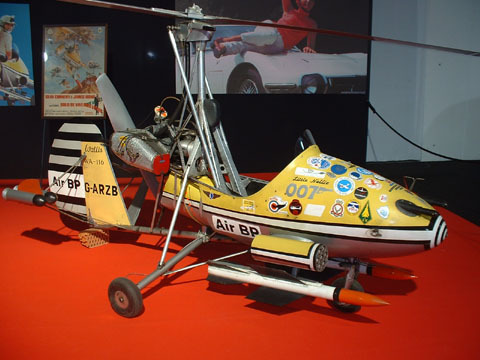 The gyrocopter featured in You Only Live Twice starring Sean Connery and while the film itself draws a mixed response from fans, Little Nellie remains a film favourite. Wing Commander Ken Wallis, who invented and piloted Little Nellie, will also be in attendance to talk about his airbourne exploits, including his time as a bomber pilot, and he will also demonstrate the unique flying machine. Little Nellie is by far my alltime favorite Bond Gadget as my dad was an experimental helicopter test pilot and used to take me up in something very similiar. I wish I could be there to take a real look at her but thanks for the update!